This text contains 56 problem solving and analytical cases, designed to develop the critical thinking and analytical skills required to get beneath the surface reality of organisational life. These provocative case studies cover a wide range of topics from motivation and group dynamics to ethics and corporate responsibility. Each case is followed by stimulating points for discussion. 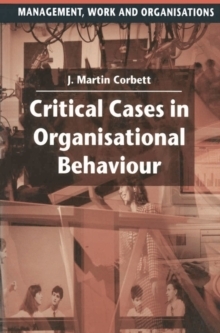 It is suitable for students on a variety of courses in Management and Organisational Behaviour. Pages: 304 pages, XI, 304 p.